I've been playing a lot of Tony Pa's elegant flash game Jorinapeka. It's a clever, emergently complex game that tickles my brain in pleasant ways. As a game design experiment, I tried to adapt that experience into an analog, tabletop board game. You can watch the video above for a demonstration of the prototype or read on. » Status: Alpha. Solid mechanics, but requires more prototyping. First, I created a clamshell box for storage and play space. (Click here for blueprints.) Then I put a sticker on one side of a blank die and drew an arrow on it. Repeat for sixteen dice total. These dice are the game pawns. For the sake of easy prototyping, I made this box smaller and used fewer pawns than would be in a full-sized game. 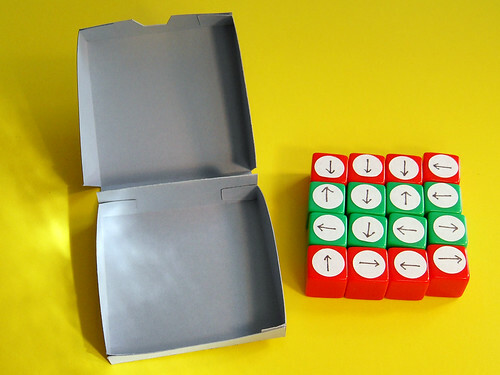 To prepare for play, place the pawns arrow-down in the smaller compartment of the box. Close it, flip it over, then open it up again. Now you have a randomized play area. On your turn, pick a pawn and move it in the direction its arrow is facing. If it hits another pawn, remove it from the board. Next, move the hit pawn the direction its arrow is facing. Continue this chain reaction until your pawn moves off the board. Keep any pawns you've hit during this chain reaction. That is the end of your turn. The next player takes their turn. She chooses a pawn and moves it along the chain reaction until a pawn moves off the board. As play proceeds, gaps will form. Pawns pass through these gaps without interruption until they hit another pawn or they move out of the box. Continue taking turns until there are no more pawns on the board. I want to come up with some juicy victory conditions. The most obvious condition is "the player with the most pawns wins." Anything else will require a second level of data on the pawns. For example, the game might come with an extra set of pawns with stars on them. These are analogous to the colored circles in the original flash game. When you prepare the board, you remove some of the standard pawns and replace them with the star pawns. All pawns are identical on the back side, so you don't know where the star pawns will appear when you open the box. The victory condition is to capture as many stars as you can. For a more complex game, I might add suits to the pawns, like Earth, Air, Water, and Fire for a generic example. The goal of play may be to score points, based on getting a certain combination of suits in a chain reaction. For example, a "straight flush." Two-in-a-row, three-in-a-row, or four-in-a-row reward you with increasingly higher point values. You may also score points if you get one of each suit in a single chain reaction. The next prototype will be larger to accommodate more pawns. I also want to add dividers between the pawns so there is more room for fingers. Constructing a box to those specs while keeping within 8.5x11 dimensions will be a challenge, but I think it's feasible. Alternatives could be something like an egg carton, perhaps. I also want to find the inherent metaphor in the game. So far, it's simply "breaking out" of the field of pawns, but taking as meandering a path as possible. Megan suggests the theme should be worms in an apple, chewing their way through the best bits. Perhaps ants digging tunnels through sand, hunting for delicious morsels for the queen. Needless to say, Jorinapeka has inspired a lot of ideas. Many thanks to Tony Pa for letting me explore these concepts in an analog medium. I look forward to bringing these ideas to fruition. Very nice. I look forward to watching you develop this. In case anyone's finding this post late, this game eventually became Utara. Re Possible victory conditions. what occurred to me was something like Nim: to make the other player take the last crumb/die/piece whatever. Nim can also work in reverse, that is the winner is the one who takes the last morsel. Something about the idea of "inherent metaphor" that you mentioned made me think of that...I dont like the idea of adding more stars or pts to the dice to make them victory pts as it seems to complicate the elegant concept. But I confess I havent studied the final product Utahara. nice ideas here; the entire website in fact. Ah, good idea. That's a nice way to add a 2p victory condition to any 1p game.